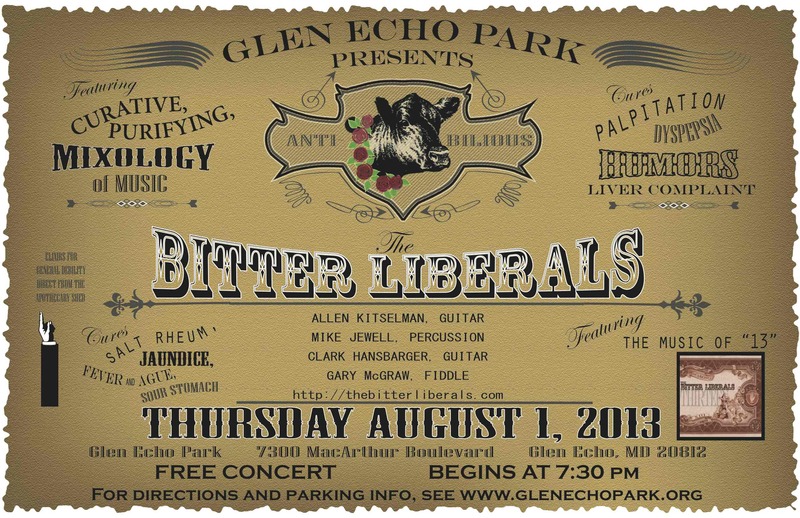 Come one come all to our concert tomorrow night at Glen Echo Park, rain or shine! We will be playing in the bumper car pavilion which is covered and has plenty of room for audience to stay dry. The chance of rain tomorrow is 30%, but that will not put a damper on our original music. We are energized from our various trips to the lake, no fly July, and general July merriment and are anxious to perform for you. TICKETS: Free! Come and bring your friends. This entry was posted in band, bitter liberals, gig, original music and tagged concert, concert tomorrow night, conga, entertainment, fiddle, glen echo, glen echo md, glen echo park, guitar, mike jewell, music, rain or shine. Bookmark the permalink.